In early 20th century, railroad cars traveled on street level to transport goods to warehouses and factories in lower west side of Manhattan, New York City. Due to many accidents between railway cars and street traffic, an elevated railroad platform was built above the streets. By 1960, trucks became the dominant freight carriers and the railroad was abandoned. 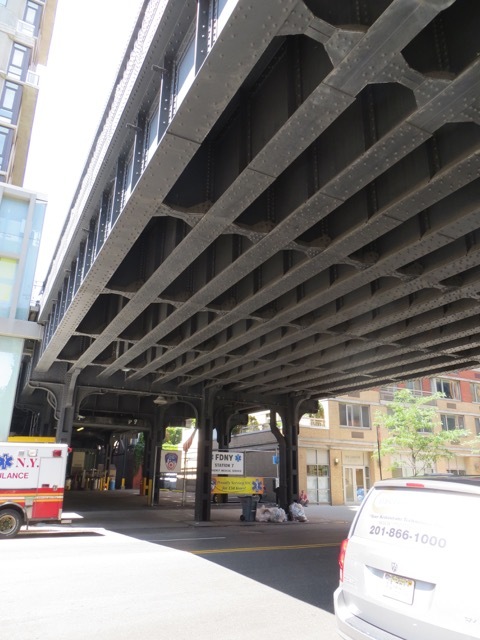 But the sturdily-built elevated tracks, 30 feet above the streets, were still in good condition. 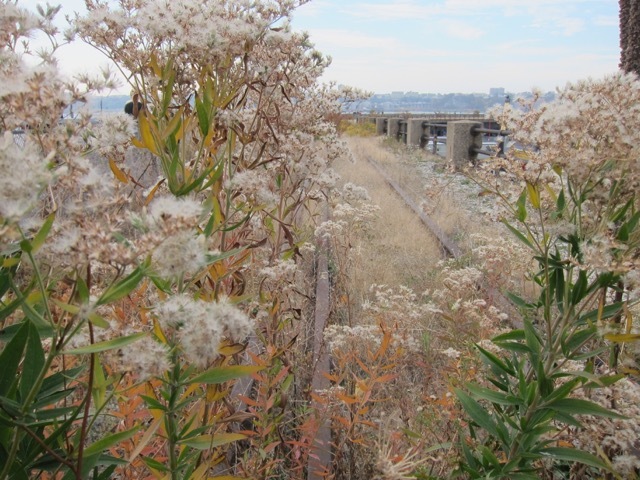 In time, the abandoned tracks became clogged with wild plants. 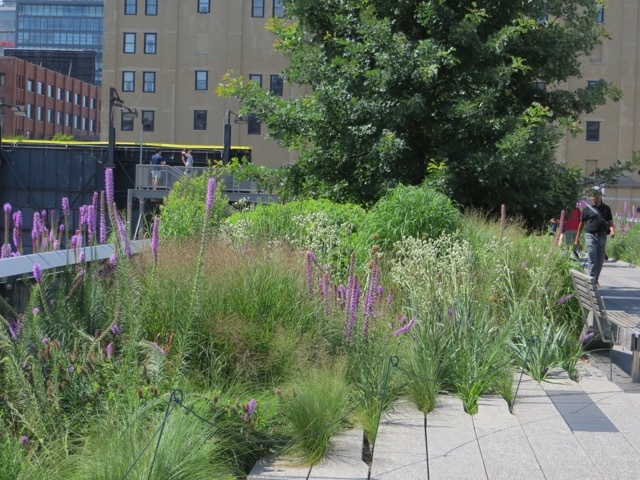 An effort was mounted to repurpose the structures into an urban park. 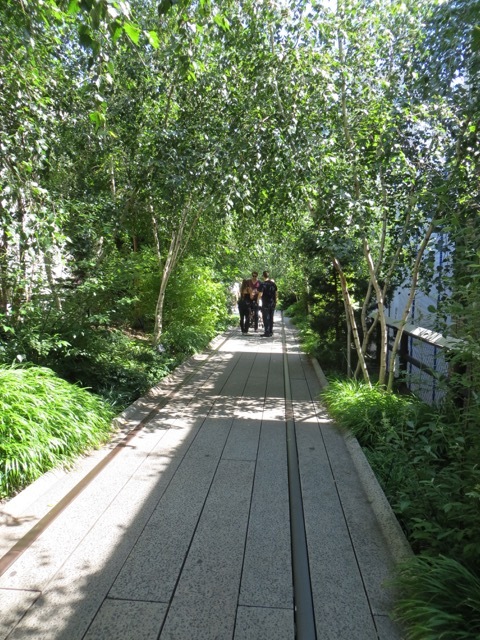 The High Line Park was opened in 2009 on 1.5 miles of platform between 14th and 34th Streets. 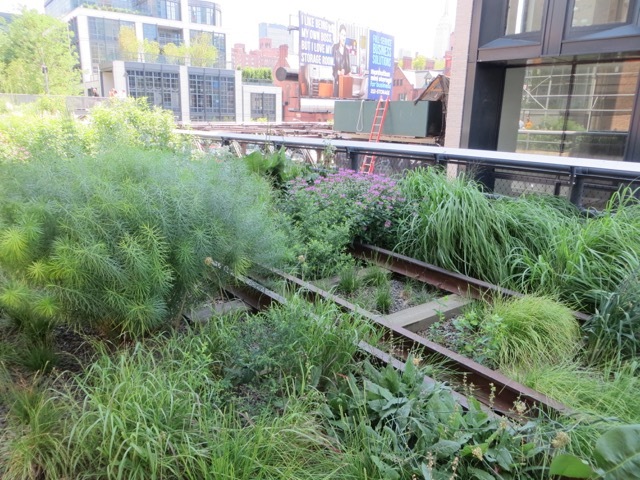 Today, High Line Park is a celebrated attraction of NYC. 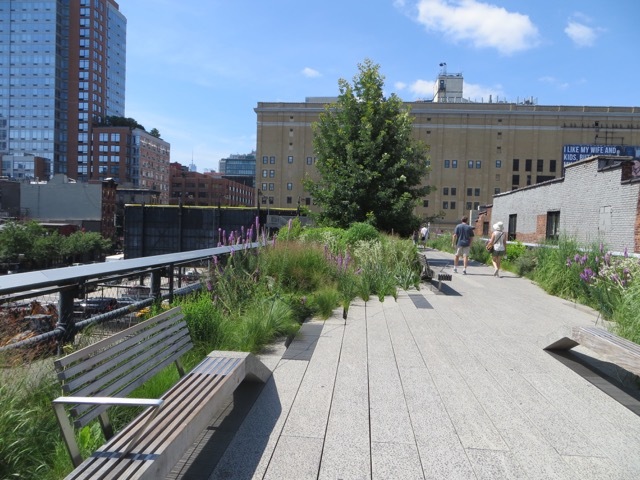 NY residents and tourists alike flock to this park to enjoy a leisurely walk among manicured shrubs, trees and flowers. 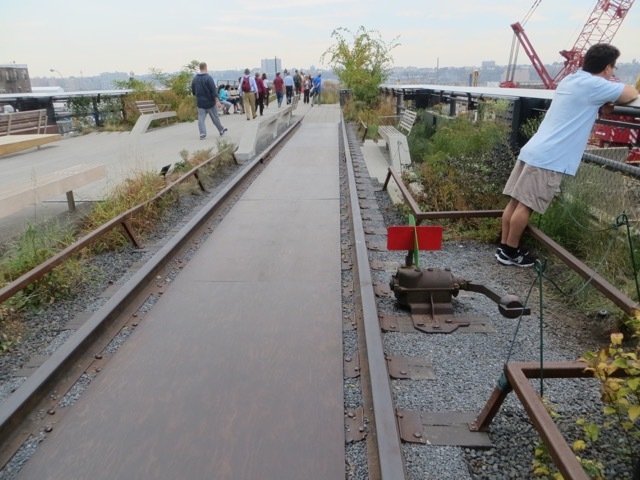 Sections of the original railroad tracks have been left in place. The plants are carefully selected and maintained by a team of professional gardeners. Beautiful native plants flower at different times of the year to greet the visitors. 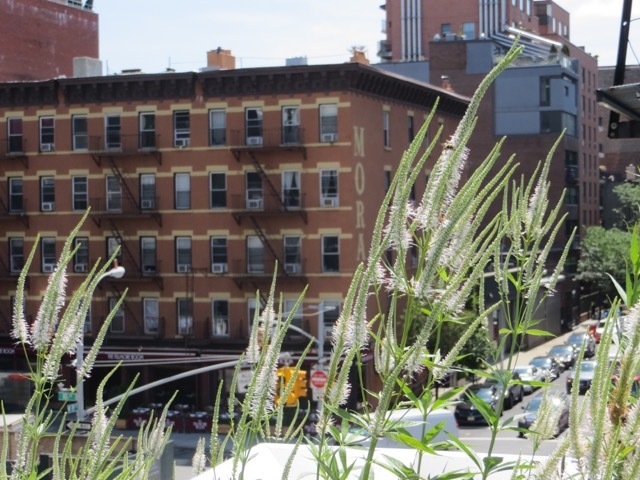 Tall grass frame tenement buildings. The park is thoughtfully designed for visitors’ enjoyment. This ankle-deep pool with flowing water cools visitors’ heels on warm days. One appreciative visitor suns himself with his feet firmly planted in cool water. 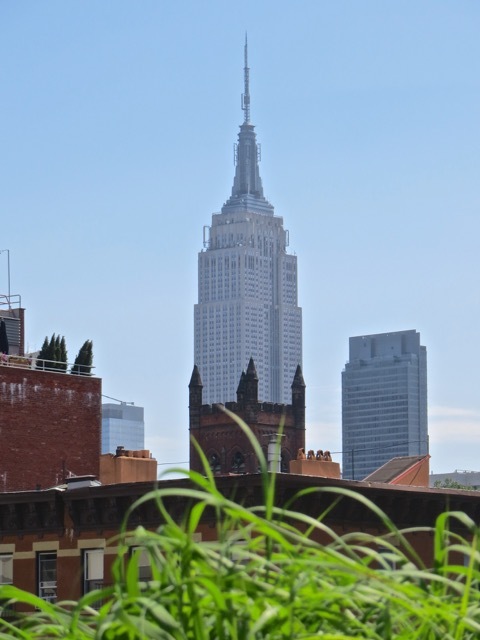 The Empire State Building appears to be growing out of a tower. The path winds through a tunnels of saplings, giving an impression of a forest path. 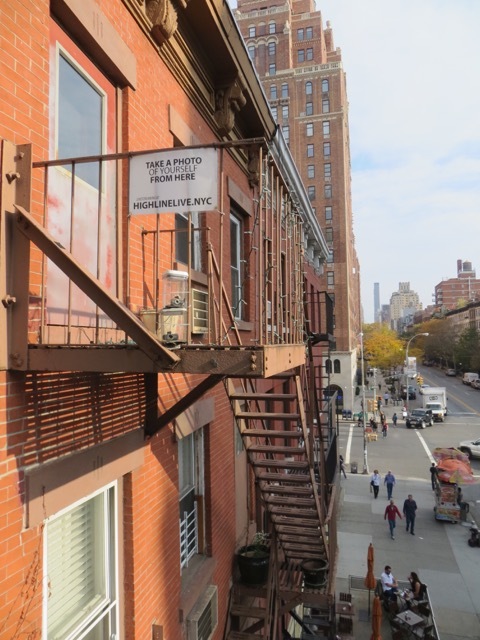 Somebody installed video cameras on this fire escape to stream High Line Park activities on his web site. 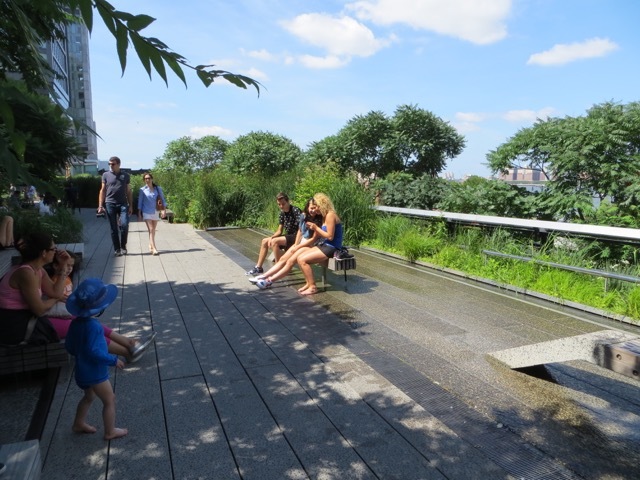 There are plenty of benches, loungers and platforms for strollers to rest their feet. But some scammers try to take advantage of the folks. 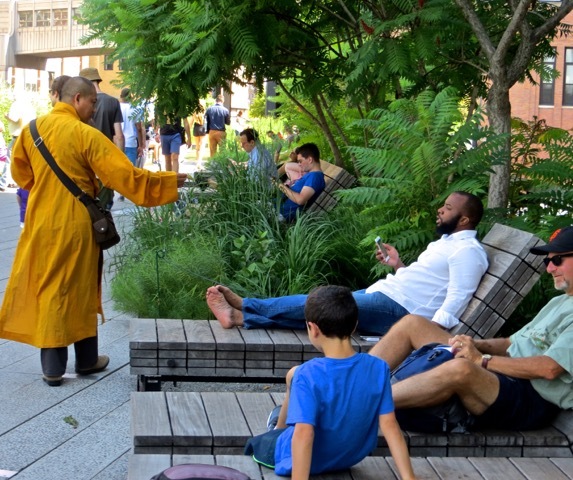 This man, wearing a Buddhist monk’s yellow robe over his street clothing and shoes, solicits donations or tries to sell fake blessing trinkets. 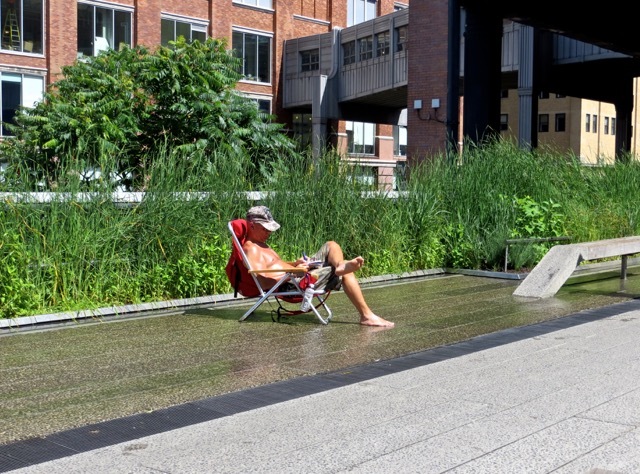 The section of the park between 14th and 23rd Streets is very comfortable and relaxing. 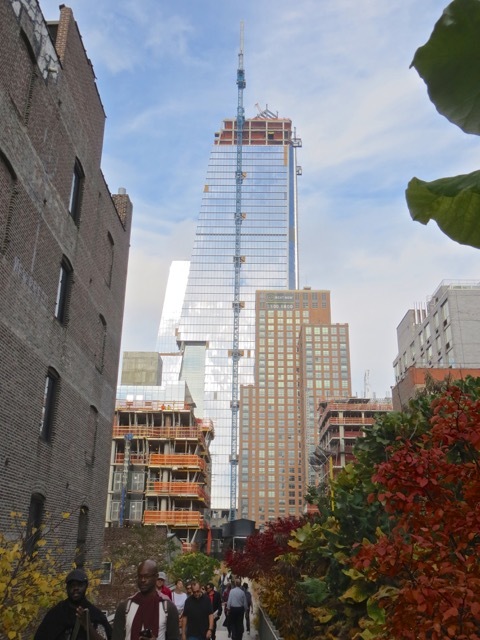 But the park above 23rd Street is becoming cramped and oppressive. 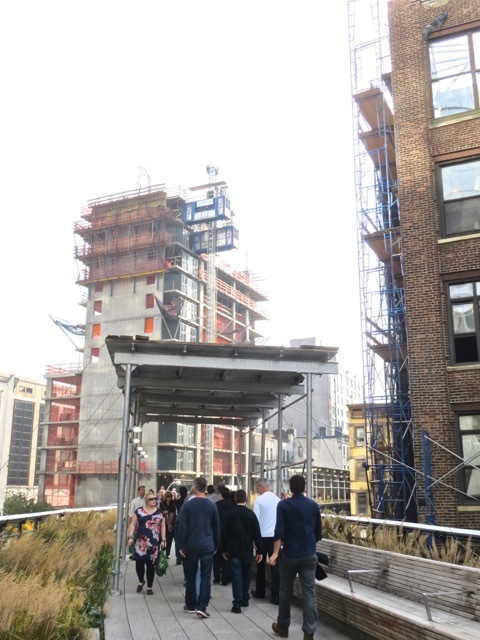 In this currently fashionable neighborhood, new housing is sprouting up alongside the High Line Park. 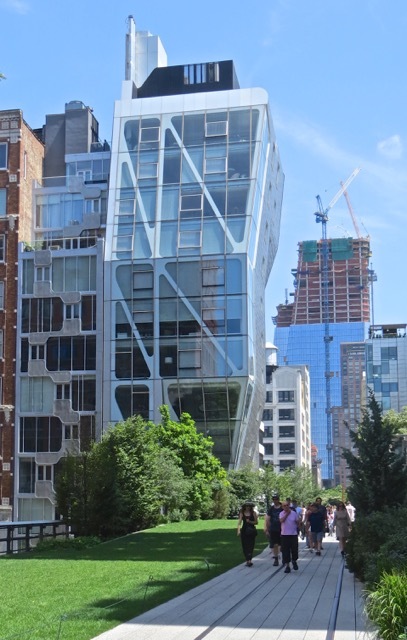 Many of these new building are faced with stainless steel for the modern look, and their proximity to the park is a selling point. 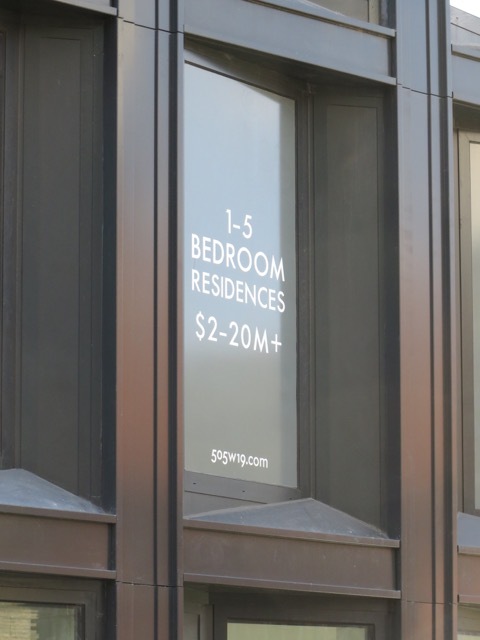 One building adjacent to the park prices its apartments at more than $20 million. On the street below, a scavenger looks for bottles to collect the 5 cent deposit. The buildings being built on all sides of the park close in on the strollers like the sides of a deep canyon. 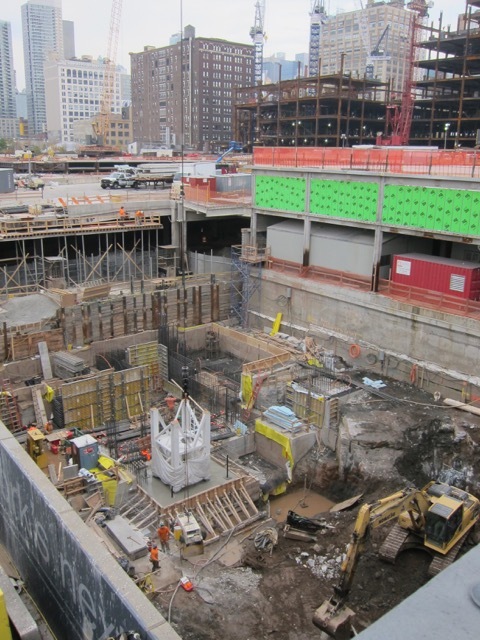 The visitors are bombarded by the clanking of metal and the roaring of construction machinery. Even further north, the elevated platform has not been built into a park yet. Vegetations are “self-sown” and railroad accessories are still in place. 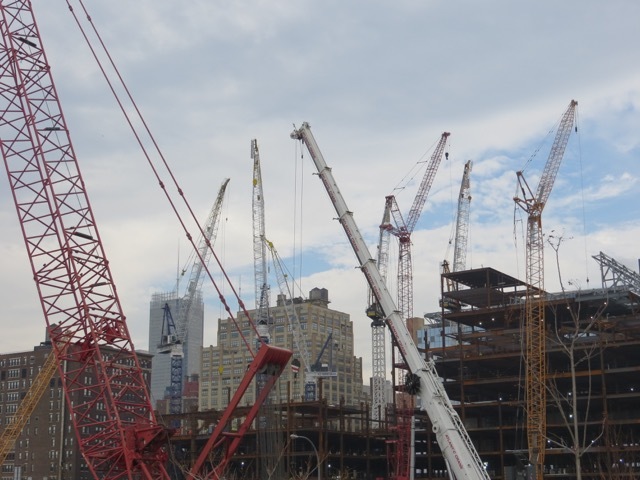 Nearing 34th Street, the area is undergoing a construction boom amidst a forest of cranes. 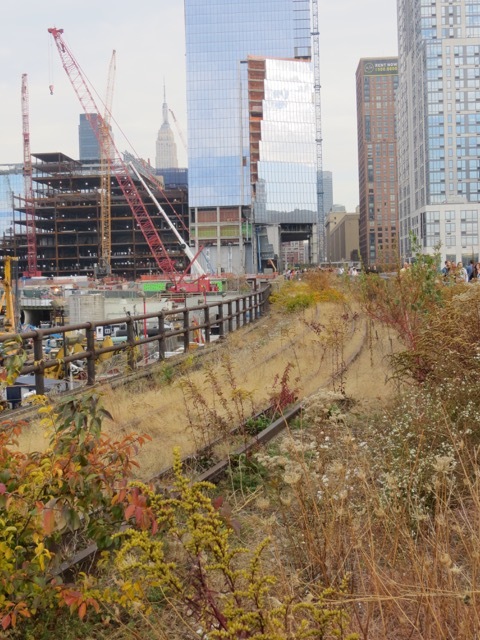 In the section of High Line Park above 23rd Street, it is primarily a noisy construction zone with tall buildings on all sides. 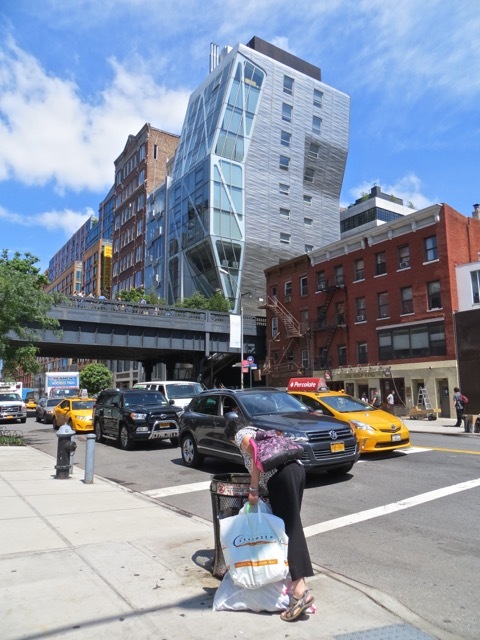 If you want to have a relaxing, leisurely stroll in a beautiful setting, I suggest that you stay below 23rd Street. Posted by Robert Wu on Saturday, November 7, 2015, at 4:04 pm. Filed under Uncategorized. Follow any responses to this post with its comments RSS feed. You can post a comment or trackback from your blog.